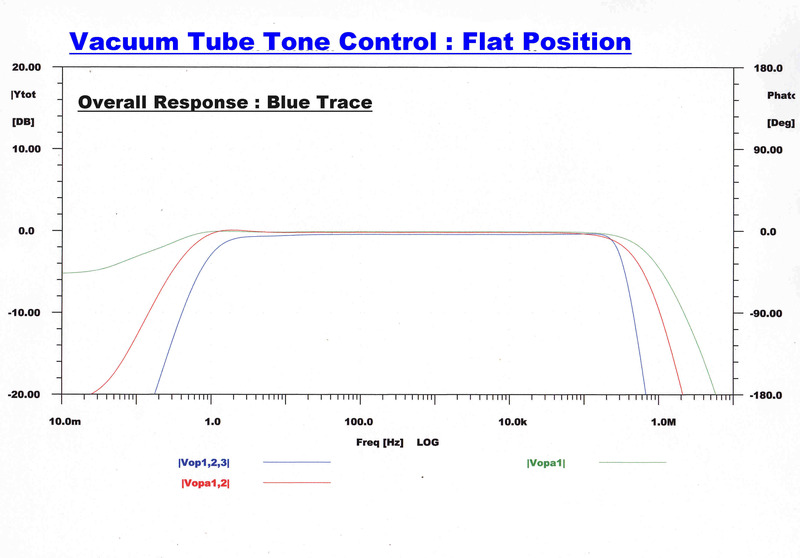 This section describes the design and performance of a universal tone control. Often it is desirable to modify the response to program material, especially material from old sources. The tone control can provide either a boost or cut independently at high and low frequencies. 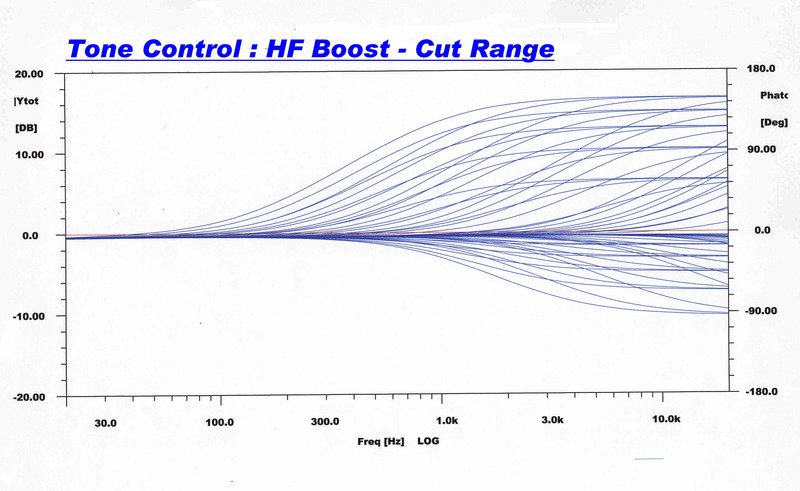 The onset frequency of the bass or treble boost or cut can also be independently controlled. The input stage is designed as a four channel mixer. (a) Bass Cut or Boost. On center this control provides a flat response. Clockwise it provides a maximum boost of 16db. Counter clockwise it provides a maximum cut of 10db. This controls the turnover frequency of control (a) over a range of 20:1. The interaction between controls (a) and (b) is analysed below. (C) Treble Cut or Boost. This controls the turnover frequency of control (c) over a range of 100:1. The interaction between controls (c) and (d) is analysed below. It is frequently desirable to have the preamp - disc eqialiser and tone control separate from th power amplifier and speakers. The output amplifier has been designed to drive 10 metres of unterminated cable. 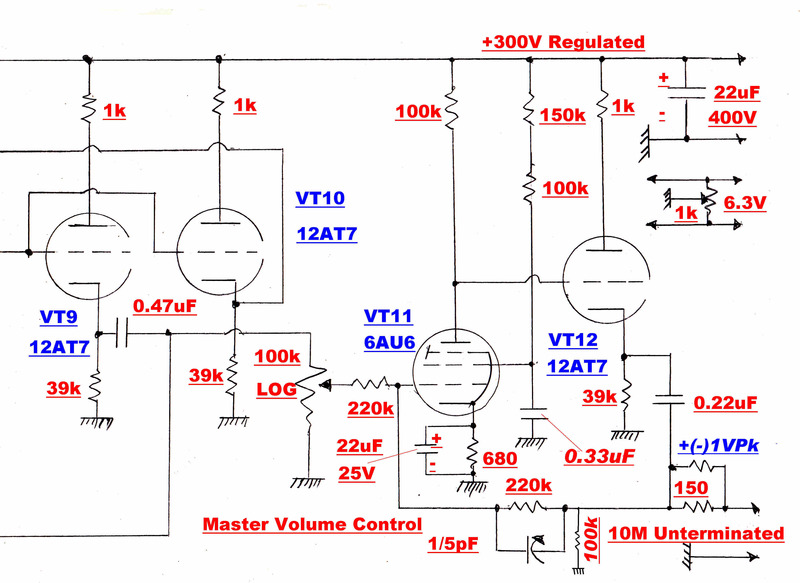 Most power amplifiers have an input resistance above 100k and satisfy this condition. The input amplifier consists of VT1 and VT2 and is represented in the simplified circuit as an operational amplifier. The high degree of feedback forms a virtual earth on the grid of VT1. This prevents interaction and coupling between the four inputs. The overall gain is very nearly unity and the low output impedance provides a convenient drive to the tone control. The 6AU6 - 12AT7 amplifier configuration is used throughout the tone control. It has an overall gain of 218. 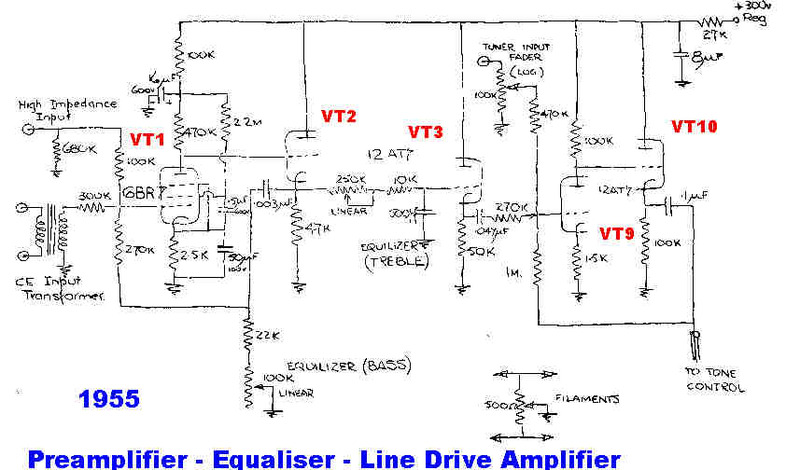 Its design and details are given in the preamplifier- equaliser section. The amplifier shown on the right is the basic building block of the tone control. 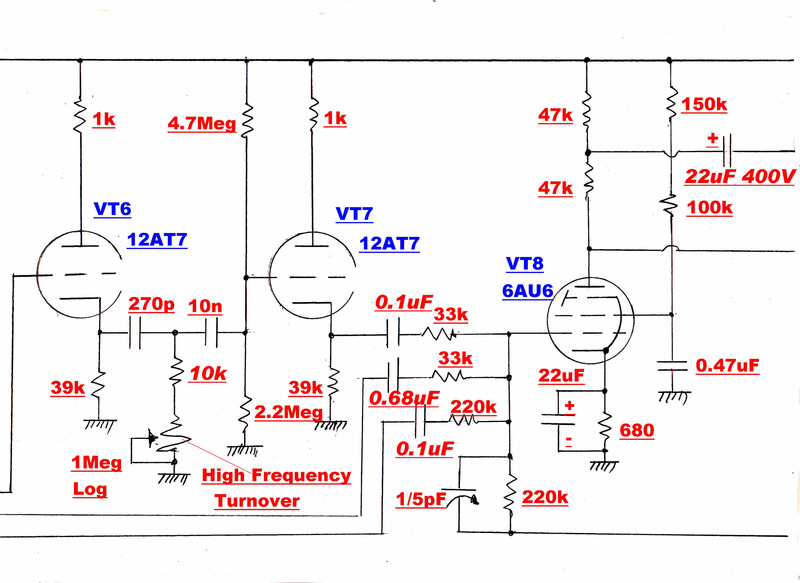 It consists of a pentode voltage amplifier - 6AU6 - followed by a triode cathode follower - 12AT7. 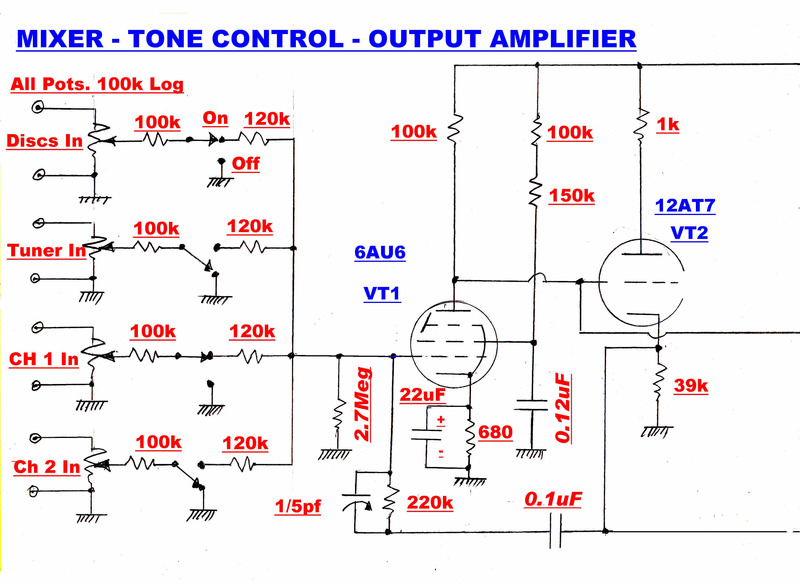 The amplifier is used as a summing amplifier with a large degree of feedback. The cathode follower and high voltage feedback produce a low output impedance. The feedback also makes the amplifier immune from transients on the high tension line which is supplied from the high performance regulator. The output from the 100k (log) boost- cut potentiometers is (+1) x the input when set to the boost end. And ( -1/9 ) x the input when at the cut end. The low frequency channel is filtered by a single order lowpass filter and added to the original signal. The roll over frequency is set by a 1Meg ohm pot. The two signals from the potentiometers and the input signal are then added algebraically in the summing amplifier VT8, VT9, VT10. When the signals add, boost occurs - when the signals subtract cut occurs. The high frequency channel is filtered by a single order highpass filter and added to the original signal. The roll over frequency is set by a 1Meg ohm pot. The high and low frequency responses are completely independent. VT3, the 39k cathode load, the 4.333k plate load and the two 100k potentiometers form a bridge which is balanced when the potentiometers are centered. Note: When 100k Log potentiometers are centered, the resistance of the two sections is 10K and 90k. This means that there will be no output from a centered potentiometer if the ratio of cathode to plate voltage is 9:1. At audio frequencies the same current flows in the cathode and plate circuit, so the total resistance in these circuits must have a ratio of 9:1. Imagine the potentiometers centered with no voltage appearing on their outputs. The plate load must now be 4.333k since 4.333k//5k = 2.321k. The 4.333k load is best made up of a 3.9k resistor in series with a 1k linear trim pot. It is important that the bridge remain balanced well above 20kHz. The leads from the cathode of VT3 to the potentiometers mounted on the front panel will have considerable capacity to earth. 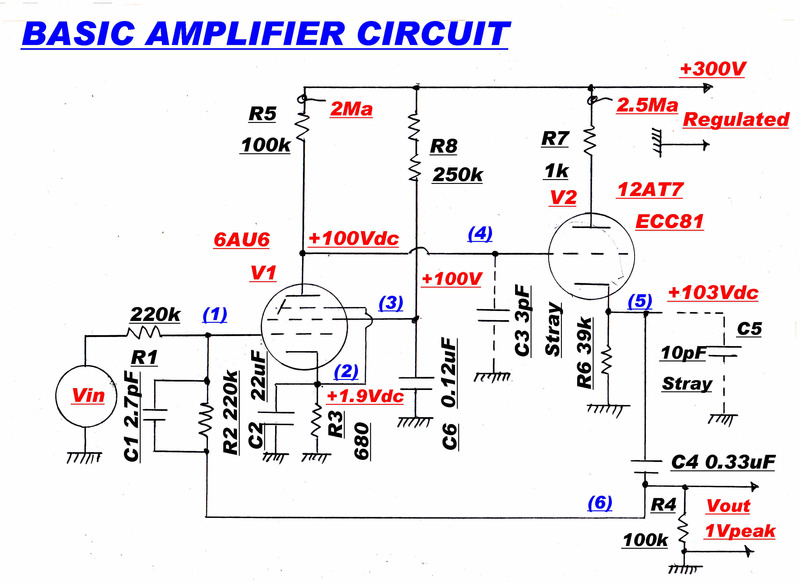 This is shown on the simplified circuit as Cs. A capacity Cs/9 must be added to the plate circuit to restore balance. The single order R-C low pass network between VT4 and VT5 has a variable turnover frequency from 15.2Hz to 339Hz. The single order R-C high pass network between VT6 and VT7 has a variable turnover frequency from 977Hz to 59.3KHz. The two 33k resistors added to the front of the mixing amplifier reduce the gain around the feedback loop. 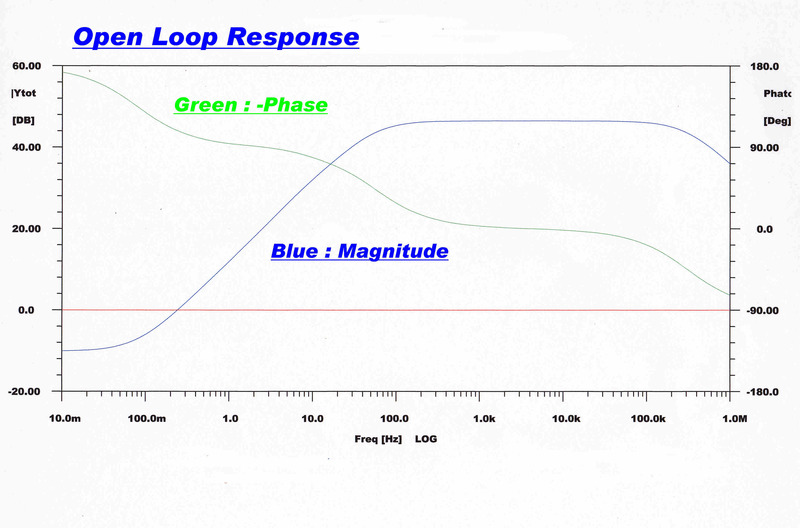 The open loop amplifier gain must be increased to compensate for this. The gain is increased by bootstrapping the load on VT8 through the cathode follower VT10. This increases the load resistor, and hence the gain of VT8, by a factor greater than 20. 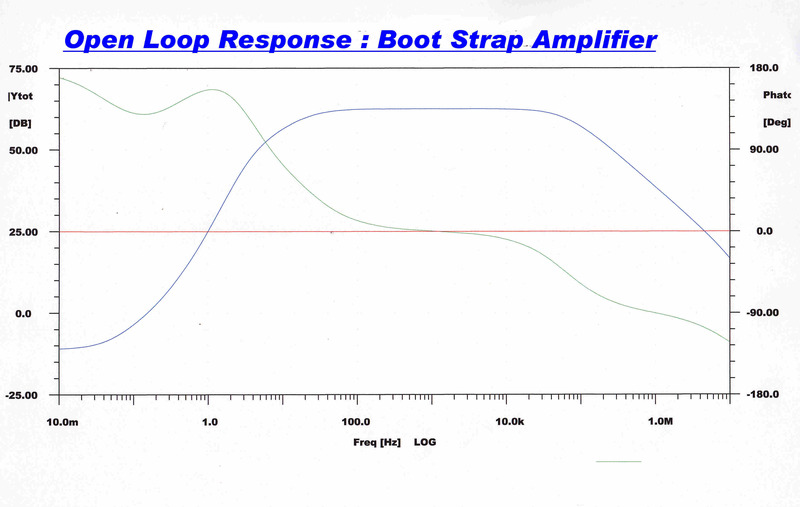 This is the open loop response of the basic amplifier without bootstrapping. 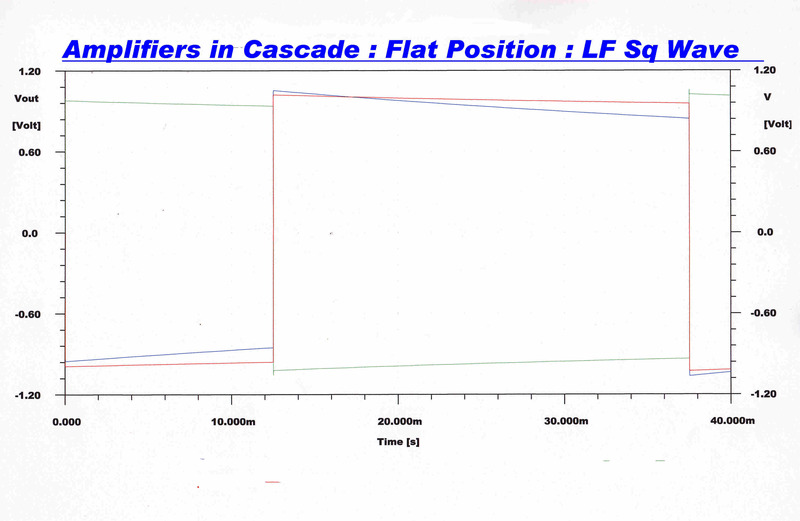 The amplifier response with bootstrapping showing the increase in gain. Since the plate load has been increased and the capacity in the pentode plate has remained constant, the top cutoff frequency has decreased. The line drive amplifier is designed to drive 10 metres of unterminated 75 ohm coax cable. The capacity of the cable is about 616pF and its reactance at 20KHz is 12.92k. This is easily provided by the cathode follower VT12, which has a standing current of 2.5Ma. 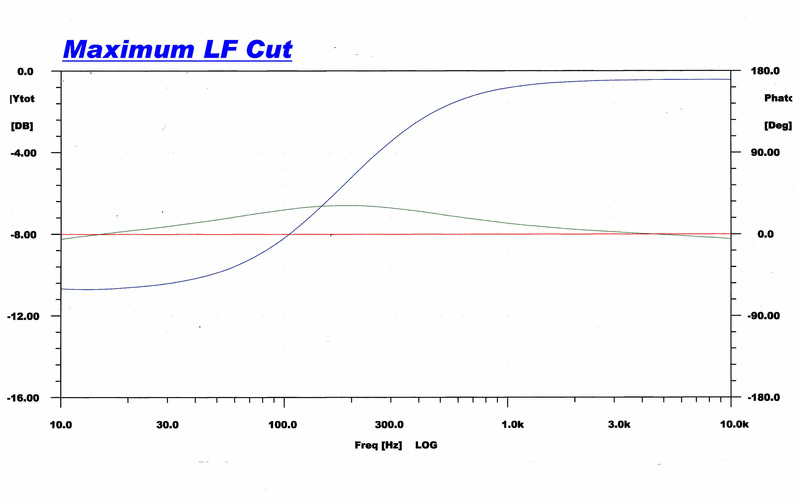 Because of the heavy feedback, the output impedance looking back into the cathode follower is close to zero. The output impedance seen by the cable is therefore 75 ohms resistive. This terminates any reflected signal. The transfer function of the tone control consists of a pole and zero on the negative real axis for low frequencies and another set for high frequencies. The cutoff frequency control determines the position of the pole, and the boost - cut control determines the relative position of the zero. A is the gain set by the boost- cut control. Positive for boost : negative for cut. Yc(p) is the single order transfer function set by the frequency control. Note : A is the relative gain between the direct path to the mixer and the the path through the R-C network. If A is positve the zero will lie left of the pole and there is a boost of ( 1 + A ) at DC . After this the gain is unity. Here the gain A is negative. If |A| > 1 the zero lies in the right half of the p plane and produces an unwanted non-minimum phase function. 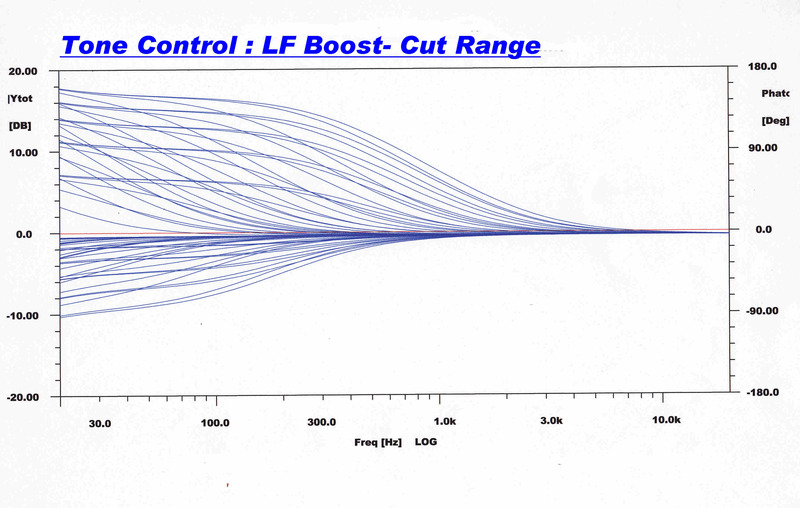 NOTE: The onset frequency of the cut or boost varies with the setting of the cut/boost potentiometer. 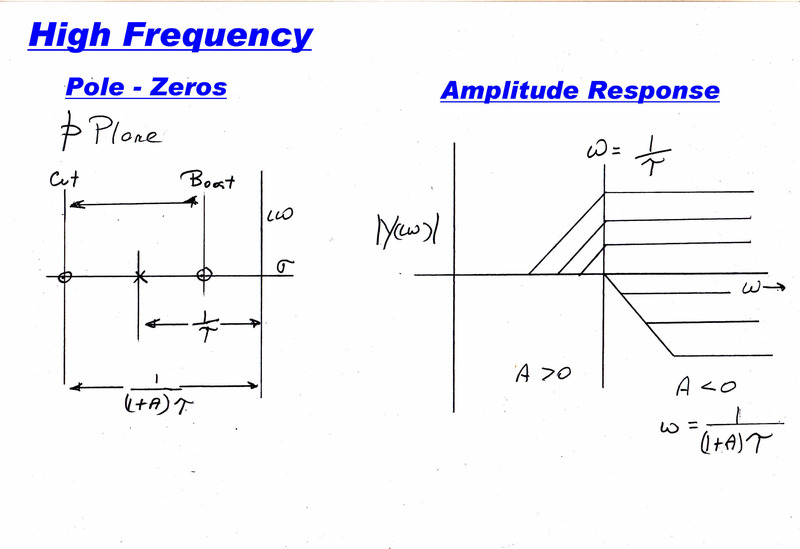 The pole - zero distribution and the steady state frequency response are shown above. 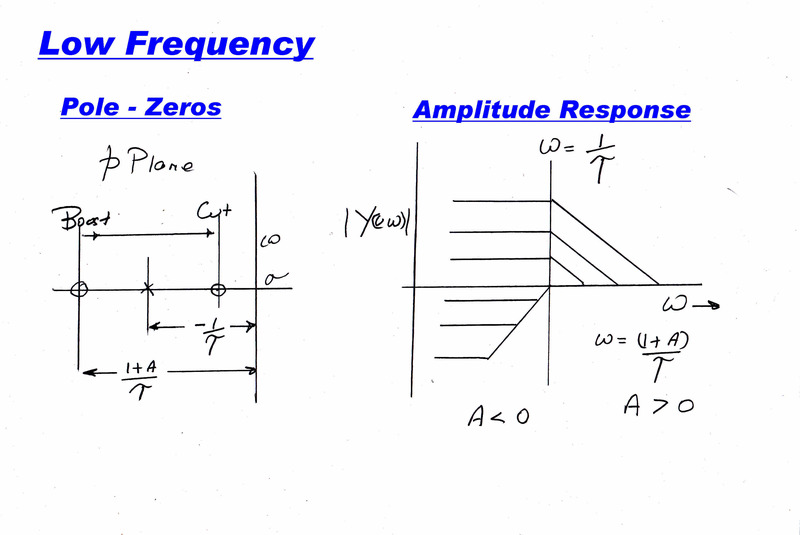 For low frequencies the 1/(τp) terms are very large and the transfer function equals 1 . The tone control is flat with a gain of unity. For boost A is positive. The zero lies between the pole on the negative real axis and the origin. 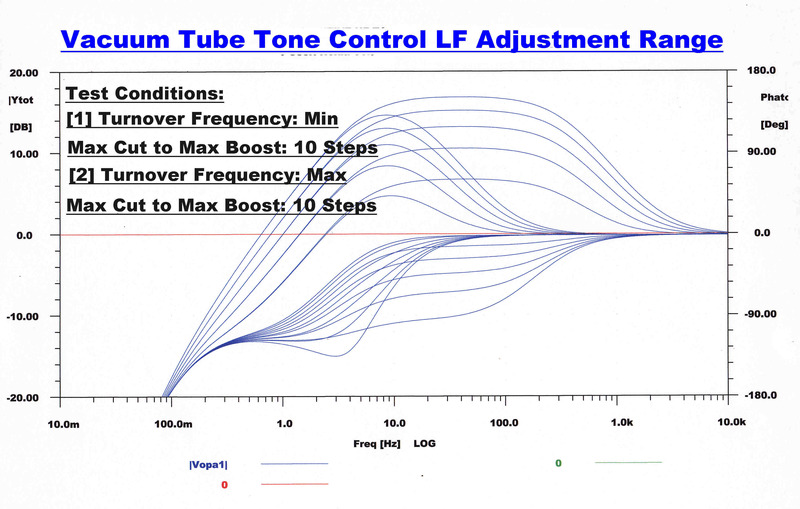 The typical response of the tone control on full low frequency boost is shown above. 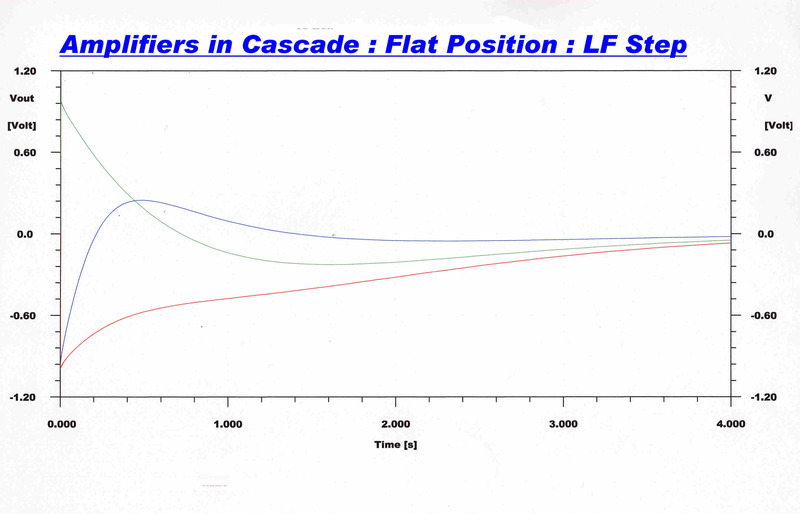 The maximum boost can be calculated from the pole - zero analysis given above. 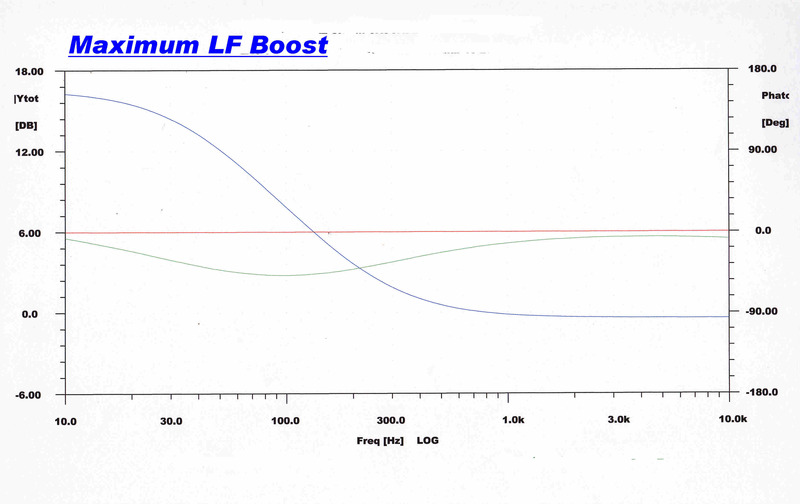 Boost = 1 + A = 7.333 = 17.3db. 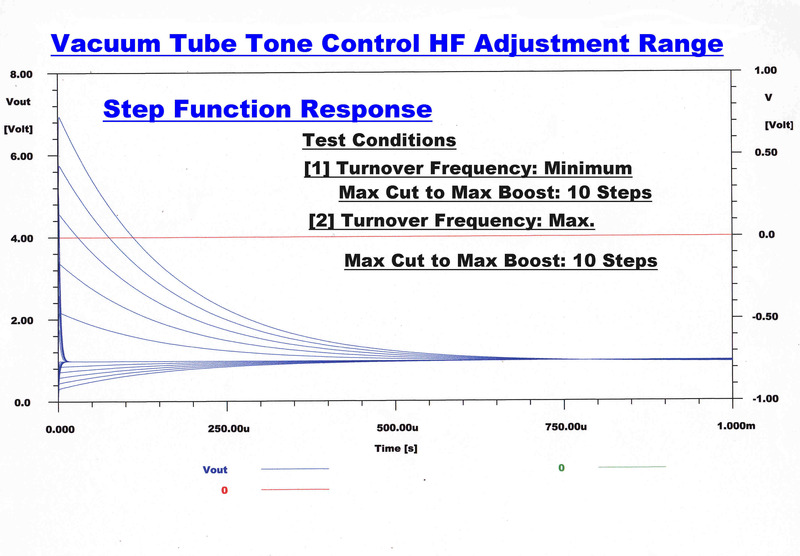 The typical response of the tone control on full low frequency cut is shown above. Cut = 1 + A = 1 - 0.7037 = 0.2962 = -10.56db. 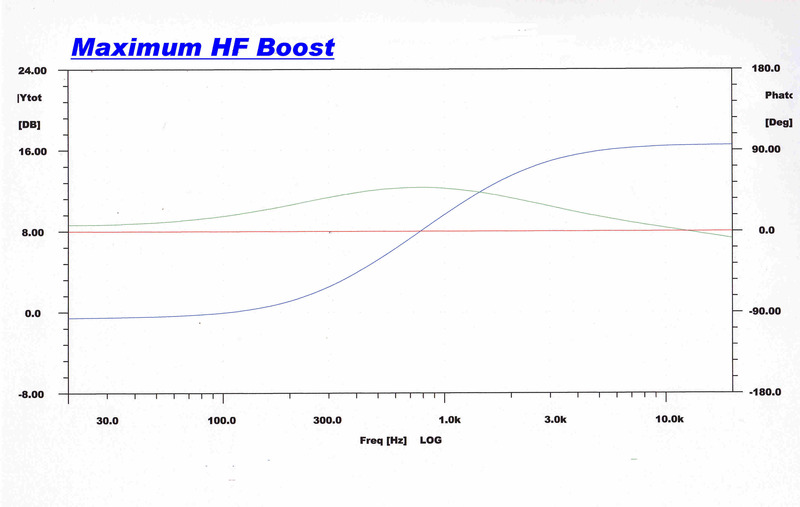 The typical response of the tone control on full high frequency boost is shown above. 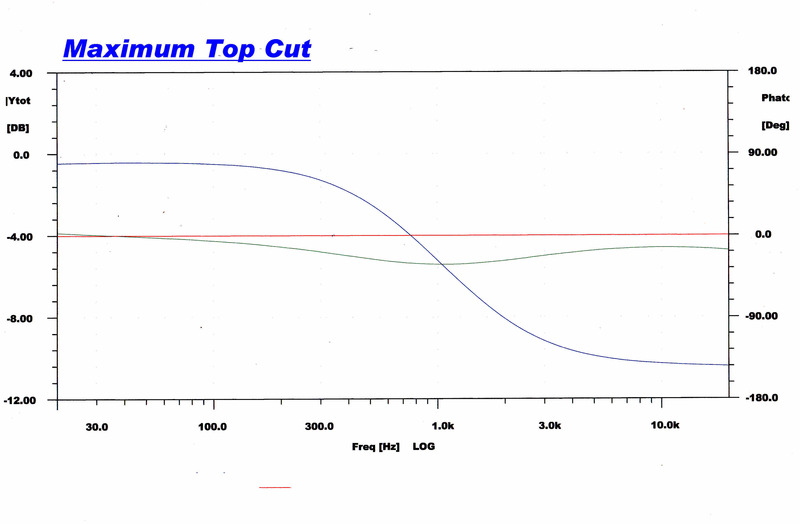 The typical response of the tone control on full high frequency cut is shown above. 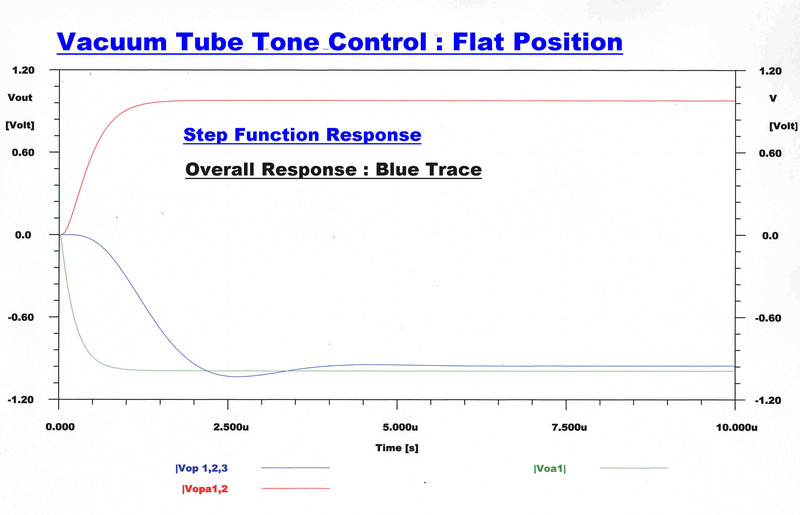 The response to the signal as it passes through the three stages of the tone control ( in the "flat" position ) is shown below. (1) The tone control is placed on maximum boost and the frequency control is moved through its full range. (2) The tone control is placed on maximum cut and the frequency control is moved through its full range. All possible responses fall within this envelope. The full range of low frequency responses possible with the tone control. The maximum boost is 17.3db. The maximum cut is -10.6db. The initial step is unity since the high frequency response is unity. In the boost position the response increases ultimately to 7.333. In the cut position the response decreases ultimately to 0.2962. The full range of high frequency responses possible with the tone control. Since the low frequency response is unity, all responses approach 1. In the boost position the maximum initial step is 7.33. In the cut position the minimum initial step is 0.296. Apply a 1KHz. 1 volt peak square wave to the input. (1) Monitor the signal on the cathode of VT2. Adjust the 1/5pF trimmer in the grid of VT2 for best rise time without overshoot. 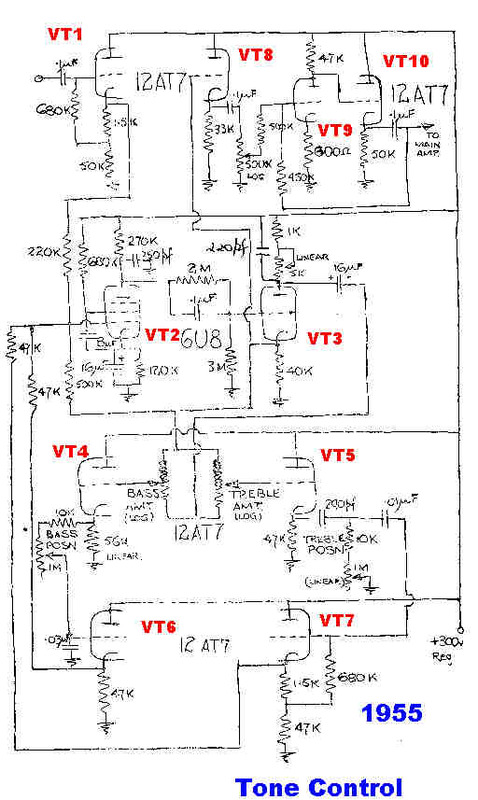 (2) The 4.333k resistor shown in the plate of VT3 is best replaced by a 3.9k resistor in series with a 1k pot. Monitor the signal on the cathode of VT6. Place both boost - cut pots in the middle position. Adjust the 1k pot until the top of the square wave goes to zero. Adjust the padder capacity until the transient at the front of the square wave is at a minimum. (3) Monitor the signal across the 100k volume control. Adjust the 1/5pF trimmer in the grid of VT8 for minimum rise time with no overshoot. (4) Monitor the output and adjust the 1/5pF trimmer in the grid of VT11 for minimum rise time with no overshoot. A short description of a preamplifier - disc equaliser and tone control from 1955 follows. The CE and MBH pickups described in the preamplifier section were used and provided a much higher output than modern moving magnet stereo cartridges. The equipment is still in use. The electrolytic capacitors have been replaced : the tubes are original. 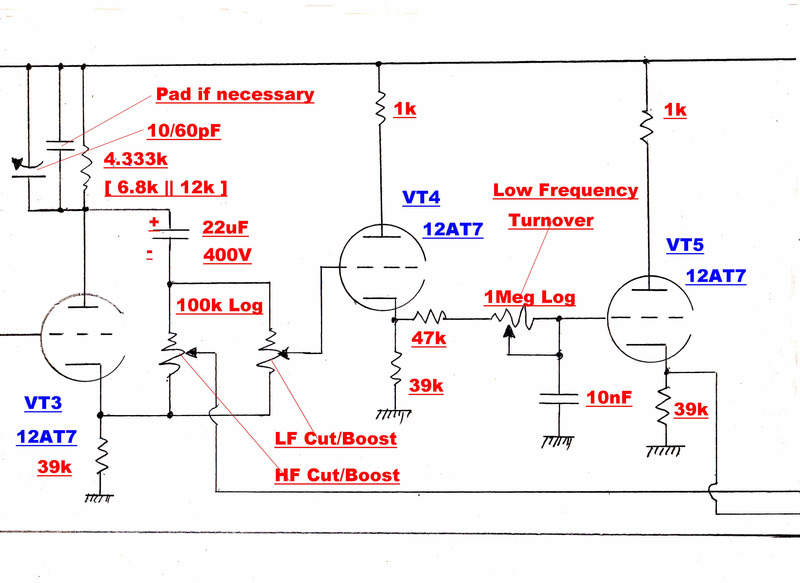 The preamplifier consists of VT1 and VT2. 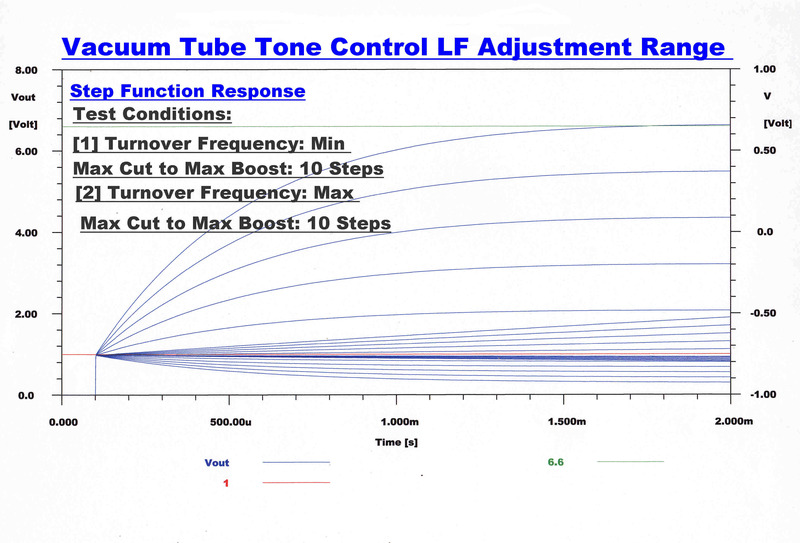 Bass boost equalisation is achieved with the 3nF AC coupling network in the feedback loop. The lower turnover frequency is 260 Hz. : the upper 630Hz. High frequency equalisation is achieved with the R-C network between VT2 and VT3. The turnover range is from 1137Hz. to 31.8KHz. For discs requiring no preemphasis correction the turnover is set to 31.8KHz. The line output amplifier is on the same chassis as the preamplifier but is deiven by the tone control, not the preamplifier. VT1 is a unity gain cathode follower. VT2 and VT3 form a high gain feedback amplifier. Variation in response is obtained by varying the amount of feedback around this amplifier through two R-C low pass and high pass networks. Cut is achieved by increasing the feedback : boost by applying positive feedback to cancel out some of the existing negative feedback. The phase splitter and 100k Log potentiometers produce a signal beteeen x1 and x(-1/9) of the feedback amplifier output as outlined in the main text above. VT4,VT5,VT6 and VT7 form unity gain buffers for the R-C networks. Note: The preamplifier and tone control have been in constant use since 1955. The electrolytic capacitors have been changed - but all the tubes are original.